Reach Out and Read Kansas City is in its’ 20th year of providing early literacy in pediatric care, here’s a brief look at how we got here! In 1996, KU Children’s Center received a grant from the Annie E. Casey Foundation to become one of the first 50 national expansion sites of Reach Out and Read National. 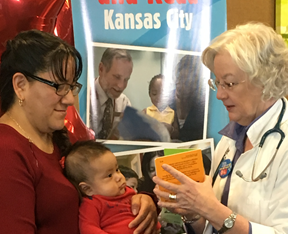 Jean Harty, M.D., was hired to begin the Reach Out and Read program in Kansas City. Dr. Harty held initial conversations in 1997 with Michele Kilo, M.D., about a joint Reach Out and Read collaboration between the University of Kansas and Children’s Mercy Hospital. In 1998, Children’s Mercy Hospital officially applied to Reach Out and Read National to become a program site, following an announcement by First Lady Hillary Clinton during a visit to Kansas City. A Steering Committee comprising Kansas University Medical Center literacy advocates voted to call the collaboration KC READS (K for KUMC and C for Children’s Mercy Hospital), developed a strategic plan, goals and a budget, and asked Laura Gregory to form and chair a Community Council. Dr. Harty was hired as the Executive Director of KC READS in the summer of 1998. 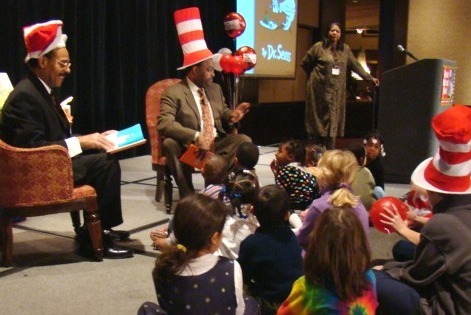 On March 2, 1999, KC READS first celebrated “Read Across America” Day at its clinic sites on Dr. Seuss’s birthday. 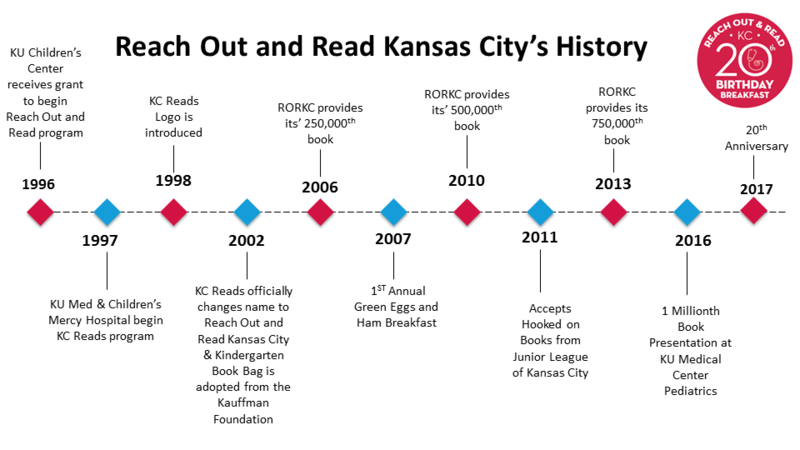 By 2000, KC READS had opened its 13th clinic site and had become the first Reach Out and Read program in the country to partner with a school district to obtain book funding through the Kansas City, Kansas, “Reading Excellence” grant. During that same year, the Ewing Marion Kauffman Foundation began the Kindergarten Book Bag program with KC READS as a major distributor, and the Junior League of Kansas City, Missouri, began a 10-year Literacy Collaboration with KC READS as a partner and beneficiary. 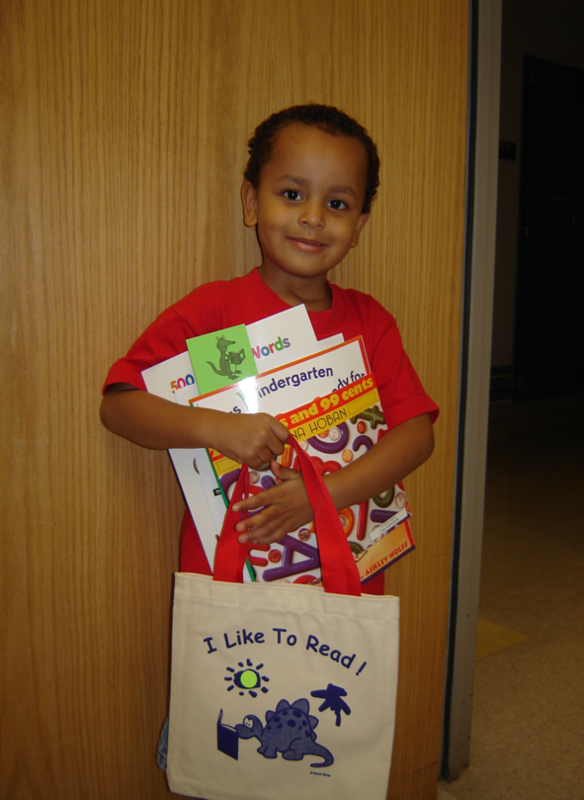 In 2002, the Kauffman Foundation transferred the Kindergarten Book Bag program to KC READS with a support grant. During that same year, KC READS officially changed its name to Reach Out and Read Kansas City. In 2006, Reach Out and Read Kansas City served 20,000 children a year in 33 clinic sites in Greater Kansas City and gave its 250,000th book to a child since 1997. During that year, it trained 185 pediatric providers to counsel parents about early childhood literacy and trained 273 volunteers to read to children in clinic waiting rooms. On Dr. Seuss’s birthd ay, March 2, 2007, Reach Out and Read Kansas City held its first annual Green Eggs and Ham fundraising breakfast with Don and Adele Hall as honorary hosts, Carol Marinovich as Master of Ceremonies and Representative Emanuel Cleaver and Bryan Busby as guest readers reading Green Eggs and Ham. For ten years, this fun and lively event was a tradition. In 2010, Reach Out and Read Kansas City served almost 28,000 children in 46 clinic sites and distributed its 500,000th book. In 2011, it assumed organization and administration of the city-wide book drive Hooked on Books from the Junior League of Kansas City, Missouri, and collected more than 32,000 new and gently used books for nonprofit organizations and schools in Greater Kansas City. By 2016, Reach Out and Read Kansas City was operating in 51 clinic sites in the metropolitan area and distributing 83,672 children new books in 27 languages to 30,000 children. Reach Out and Read gave its 1 millionth book on Dec. 2, 2016. On April 20, 2017, Reach Out and Read KC celebrated its 20th anniversary with a Birthday Breakfast fundraising event at the Uptown Theater.